Earlier this year, Toast surveyed nearly 1000 restaurant owners, operators, and managers, and found that attracting and retaining customers is one of their top three operational priorities. That may come as no surprise – we both know the restaurant industry is hyper-competitive, maybe even more so than Harvard’s undergrad applicant pool. According to The National Restaurant Association, there are over 660,000 restaurants in the U.S; the restaurant industry is currently growing at 2x the rate of the population. Standing out from the fold and successfully getting new customers in the door is a beast, but getting them to return again and again is an enigma of sorts since Americans could theoretically go to a different restaurant every day for the next 1,808 years. The thing is, without customers – new, repeat, or otherwise – you don’t have a business. On The Toast Restaurant Management Blog, we talk at length about the why and how behind restaurant marketing, including channels to leverage, tactics to add to your restaurant marketing toolbox, and examples of real restaurants who are marketing masters. While some think of marketing as a scary, all-encompassing, business term, what it really boils down to is how – and how well – you’re engaging with your customers wherever they may be. Customer engagement refers to the myriad of places and ways you can connect and converse with customers, the ultimate aim being winning their repeat business. In 2015, Corporate Executive Board conducted a study to get at the root of customer loyalty. After hosting 97,000 customer interviews, the CBE team concluded that “customers became loyal if their expectations were consistently met with quality service in both the digital as well as the brick and mortar space”. Consistently providing guests with a high-quality experience is the strongest and most effective customer engagement tactic available. In restaurants this encompasses –and extends – beyond creating a memorable dining experience for every guest. Online reservation platforms, like OpenTable. Social Media Networks, like Facebook, Instagram, and Twitter. Review sites, like Yelp and TripAdvisor. Discount and promotion sites like Groupon. While waiting for a table. Being seated at a table/bar. Ordering an appetizer or entree. Though your head may be spinning, wondering how in the world you’re going to wow guests consistently at each of these touchpoints – let alone remember all of those touchpoints – don’t be intimidated. Business jargon aside, each of these interactions represents a chance for you to show guests the hospitality that brought you into this industry in the first place. You’re a master in the art of delivering delight, whether it’s on a serving plate or in a snifter; transferring those skills to the digital realm is actually easy as pie. Let’s dive into some effective ways to boost your restaurant’s customer engagement strategy. Did you know that loyal, repeat customers generate, on average, 10x more than new customers? Investing in a restaurant loyalty/rewards program is a surefire way to encourage repeat business through incentivization. When guests who participate in restaurant loyalty programs near earning a new reward, they spend more than usual in order to get them closer to unlocking said reward; this behavior is what our friends at LevelUp call the “points pressure mechanism”. How much of a spike are we talking about here, you ask? A substantial 39%, says LevelUp. 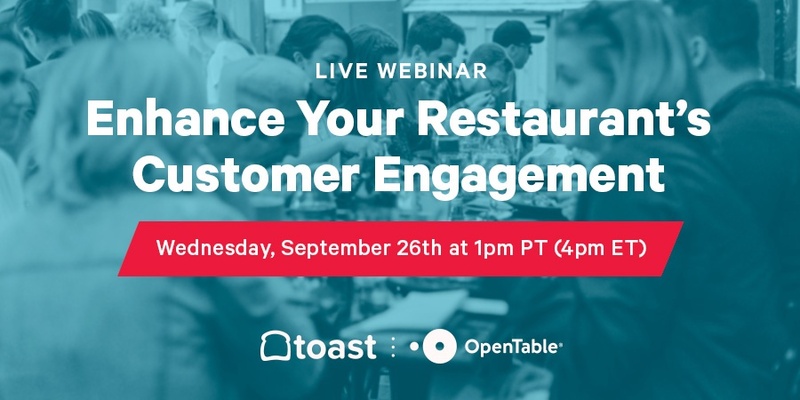 At Toast, we’ve similarly found that restaurant-goers who participate in Toast hosted loyalty programs spend, on average, 39% more than non-loyalty guests. Hosting a restaurant loyalty/rewards program for your guests is not only a great revenue driving tool, but also a means of communication with your guests. Remember: communication is the foundation of any great relationship. During sign-up, guests are typically asked to input their email address in order to receive updates about the amount of points they've earned, rewards they've earned, and rewards they're close to earning. Toast's loyalty solution allows restaurant owners and operators to customize the rewards they're sending out to guests – a birthday discount instantly comes to mind – further reinforcing the personal relationship between management and guest. 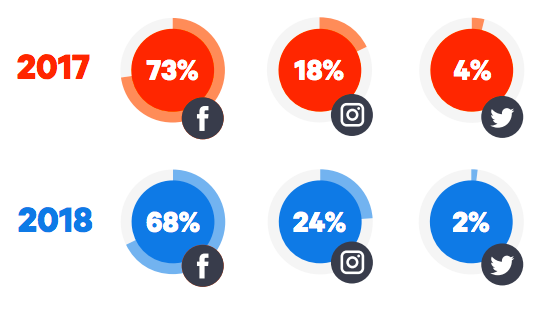 While it’s important to cultivate a social media presence across all popular channels, content isn’t the only thing that can be trending; social media sites themselves rise and fall in popularity. Social media is undoubtedly your best friend when it comes to increasing your restaurant's brand awareness and it's also a great tool to build consumer brand trust. Sure, the self promotion aspect of social media can be addicting, but don’t forget that its core mission is to bring people together from every corner of the globe. Establish and cultivate relationships with your follower base through consistent interactions and open communication. When a follower comments on a picture you've posted, have a conversation with them in the comments section; if you see a customer has tagged your business in a photo or post, share it on your page. Who knows, they may even share your share! According to Forbes, "62% of millennials say that if a brand engages with them on social networks, they are more likely to become a loyal customer. They expect brands to not only be on social networks, but to engage them." Millennials, the generation that now comprises 1/3 of America's total population, are skeptical of – and don't support – faceless brands. So, put a face to the name. Email truly is the OG form of digital communication. Even in this new era, where it seems a new method of electronic communication pops up weekly (DM-ing, anyone?) 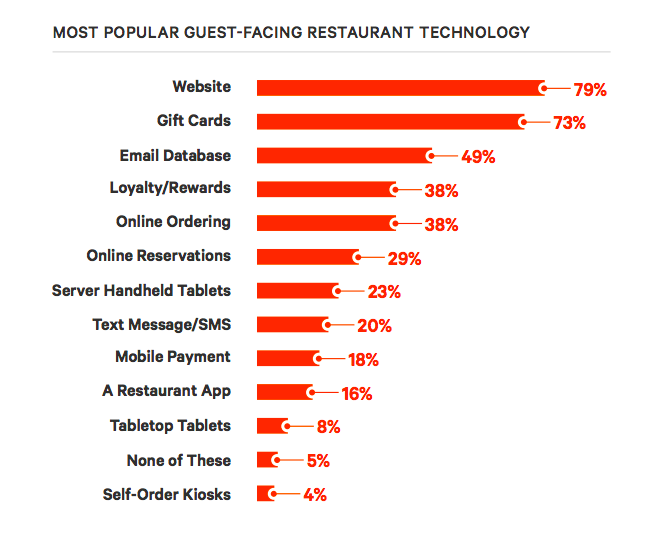 business owners continue to lean on email marketing as a simple, reliable, tried-and-true mass communication method; in fact, an email database is the number three most popular guest-facing piece of restaurant technology. An email database is a marketing utility player. It can be used to address your entire customer base en masse about important operational updates, including changes to your operating hours, a brief hiatus for construction, the addition of new menu items, or alerting them the patio is open for the season. It can also be used to connect with customers on a more personal level, whether its to wish them a happy birthday with a drink "on the house", an invitation to a VIP event, or early access to make a reservation for a popular dining-out holiday like Valentine's Day or The Super Bowl. 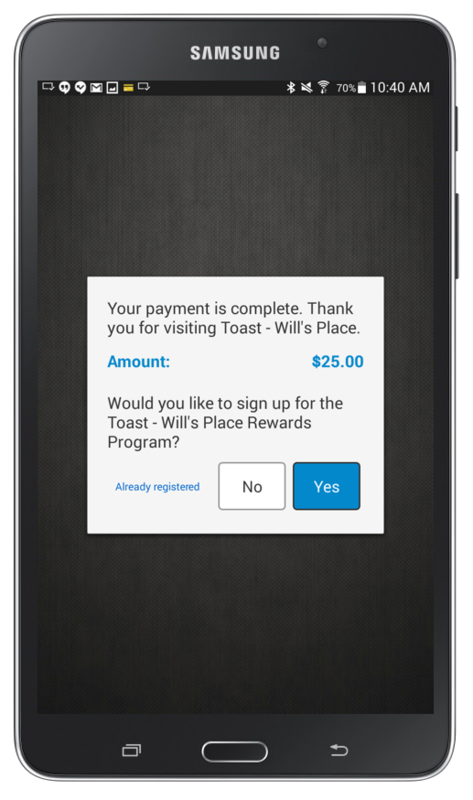 Certain restaurant point of sale systems, like Toast, allow guests to sign up for your email list as they're paying they check. Other tactics include putting an email sign-up box on your restaurant's website or incentivizing existing newsletter participants for getting their friends to sign up. It's important to remember quality over quantity is the right philosophy when it comes to email marketing. You want to connect with your guests regularly, but not so much that you're cluttering their inbox with nonsense. You never want to find your restaurant a part of the 'defacto delete group' – you know, those emails you don't remember signing up for, never open, and always delete. You can't please everyone all the time, especially in the restaurant industry. Unfortunately in this day and age, even your smallest operational bloopers – like water spots on a fork or a forgotten lemon wedge on a water-with-lemon order – can have a permanent impact on your business thanks to the prevalence and popularity of restaurant review sites. Before the ink is dry on a negative review, the damage is already done: 84% of consumers trust online reviews as much as a personal recommendation from a friend. That's a lot of potential business to lose out on. Here's the thing: 65% of negative restaurant reviews are posted within 24 hours of a poor dining experience taking place. A restaurant owner, operator, or manager can only be so many places at once; it's pretty likely that an unhappy customer will slip out the front door without you or another member of your restaurant's management team having had the chance to smooth things over. So, how are you supposed to get to these guests in 24 hours or less? Technology. 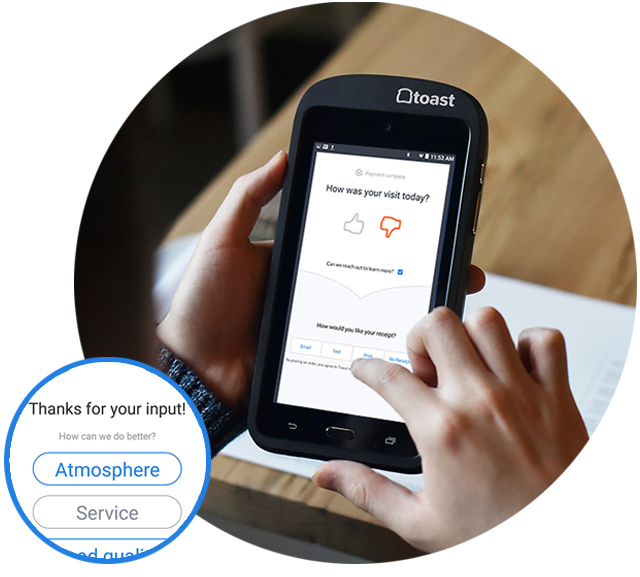 Toast recently unveiled a new guest-feedback feature that allows restaurant owners and operators to receive instant notifications when a guest rates their dining experience poorly on the survey included during the payment process. By providing restaurant owners and operators with instant access to guest feedback, they have the opportunity to rectify the situation with unhappy guests and prevent negative online reviews from affecting their restaurant's reputation. Feedback doesn't have to be a dirty word; positive feedback letting you know what your restaurant is doing right is just as valuable to your business. Who doesn't want more of a good thing? Don't let you and your staff get bogged down by the bad: circulate positive feedback you receive from guests via the guest feedback feature to your staff in order to improve employee morale. In the event that a negative review does slip through, it's important to respond. Though the poor dining experience in question is in the past, the repercussions of a bad online review can linger well into the future. 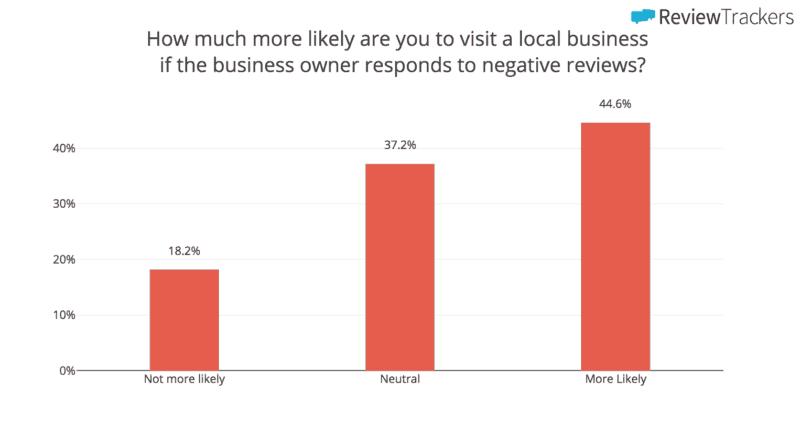 A ReviewTrackers study found that 44.6% of consumers are more likely to visit a business if the owner responds to negative online reviews. There are as many ways to engage with your customers as there are people on this earth. It's important to make sure that, above all else, whichever methods you choose to employ align with your restaurant's brand and voice. What is your favorite way to engage with customers? Leave your tips in the comments below!